Editor’s note: This story contains hate speech and crude language, and could be disturbing to readers. Although police have not publicly identified anyone involved with Giusti’s death, they have acknowledged that the opposing group included two dozen high school and middle school-age children and that they are working with the immigrant community as part of the effort to track down everyone involved. That’s been enough to fuel rumors that a Somali youth killed Giusti, a white man, and to fuel the prejudiced sentiment that all Somali residents are to blame. But as some people name-call and threaten violence, others — including Giusti’s family — have embraced the area’s immigrant community. They have called for calm and cooperation. That immigration trend continued in 2001, when the first Somali families — predominantly poor, black, Muslim and often still learning English — began moving to the city. In October 2002, then-mayor Larry Raymond wrote an open letter to the Somali community asking them to stop coming, saying their influx was putting too great a strain on city and school services. The letter and ensuing media coverage publicly revealed stirrings against Somali families in Lewiston and led members of the white-supremacist group World Church of the Creator to plan a rally in Lewiston. On a January day in 2003, a handful of spectators gathered in a small meeting room near a Lewiston industrial park — the only location allowed by the city — to listen to speakers from the World Church of the Creator. Meanwhile, across town, 4,000 to 5,000 people gathered at Bates College for their own rally to promote tolerance and embrace the Somali community. Since then, thousands of Somali immigrants have moved into Lewiston. While Somali families remain the largest immigrant population in the city, families from other countries have joined them in recent years, including people from Burundi, Djibouti, Ethiopia and Sudan, among others. “I’m hearing 30 or more nationalities now that live in the community,” said Phil Nadeau, who retired last year after 18 years in city administration. He worked closely with the immigrant community for nearly two decades. Since 2001, Lewiston has regularly made national and international headlines for its mix of native and new Mainers. This week, Netflix optioned the book “One Goal” about Lewiston High School’s team of native-born and Somali refugee soccer players who won the 2015 state championship. “If there was a moment when this could have gone badly, that was one of the moments,” she said. She believes Giusti’s death is another. On social media, often a magnet for anonymous hate postings, there was a spiral and it was immediate. “…deport the somalis. ALL of em,” commented Savannah with the handle @dobermanmamma on Twitter in response to a story about a uniform Kennedy Park curfew. “…f*** all you sugar coating idiots..PLAIN AND SIMPLE IT’S THE F***ing SOMALIAN YOUTH who are the problem and have been the problem for many years,” wrote Matthew Drake in a comment to a Sun Journal news story on the fight. Heidi Sawyer, a longtime community member who started the group Lewiston Rocks a few years ago to promote all things good in the city, saw the reactions roll in. Soon after Giusti’s death, Sawyer closed the Lewiston Rocks Facebook group so that only its 3,200 members could interact on the page. “Why not change the name from Lewiston Rocks to We love Somalians?” the message said. Some people turned to another Facebook group, LA’s Journal. There the posts and comments that appeared in the wake of the fight and Giusti’s death a few days later were largely anti-immigration, anti-Muslim or anti-Somali. “I’M A RACIST. . . THEY TURNED ME THIS WAY, SOOOOO. ONLY against the salamis,” wrote Joyce Williams, using a derogatory term for Somalis. Reached by Facebook message, Williams said she didn’t want to talk about her comments. Pearl Benner, the Facebook group’s founder, did want to talk. Benner, 54, said she lived on Knox Street in downtown Lewiston 30 years ago and now lives in Auburn. She started LA’s Journal a couple of years ago, she said, because moderators removed comments from another Lewiston Facebook group she’d been part of and she wanted a place where people could speak their minds. Sentiments like Benner’s are nothing new to LA’s Journal. Facebook has repeatedly suspended or banned some of the group’s 3,000 members for violating hate speech rules. Members joke about it — calling suspension “Facebook jail”— and consider removal a badge of honor. They share tips for getting around the hate speech rules, including creating multiple and fake Facebook accounts. In the days after the park fight, posts and comments against Somalis ratcheted up in the group. “Pig roast time,” wrote Mike Cribbin. While social media has been the go-to place for such comments, anti-Somali sentiment has seeped into some real-life interactions as well. Days after the park brawl, an Auburn woman went to Kennedy Park with a friend to play guitar. She said while they were there, a group of white young adults milled around the park yelling about killing Somalis and getting justice for Giusti. A couple of days after that, white park-goers stopped an African immigrant walking through the park and asked if he were Somali. The man said no and walked away, but the confrontation had its effect. “He said he wasn’t really feeling comfortable walking alone in the park,” said Hamza Abdi, skill development and language services manager for the Lewiston-based Immigrant Resource Center of Maine. Abdi himself feels a change in the city. There’s more anger, he said, more hatred. “Things are not like they were from before,” he said. Some in the immigrant community are afraid that anger will turn to violence. “A lot of people are scared,” he said. Abdi was quick to condemn the park fight and Giusti’s death: “The person who commits the crime is a criminal,” he said. At the same time, he emphasized it was not the fault of an entire ethnic group. “If a white person killed an immigrant person, I wouldn’t say all white people are bad and target all white people in speech,” he said. But while anti-Somali sentiments have been abundant on social media and some people have taken their anger to the park, there have also been public signs of support for immigrants in general and the city’s Somali residents in particular. Last Sunday, Giusti’s family joined immigrant leaders outside City Hall to call for peace and tolerance amid rising tensions. Since then, there has been a vigil, a rally, a barbecue or other peace gathering in the city almost every day. At a City Council meeting Tuesday night, more than a dozen residents spoke about the state of the downtown, the fight and Giusti’s death. No one blamed Somali residents. Most actively defended them. “My fear at this point is that we’re going to turn it into a racial issue,” Lewiston landlord Jay Allen told the council. Resident Kim Pfusch denounced what she called “race baiting” online and said angry social media posts do not reflect the community’s true feelings. “Don’t fall for it. Know that you’re being baited,” she told the council and the crowd gathered there. Between the suggestions for better curfew enforcement and a greater police presence, one speaker asked the city for Somali language workshops so neighbors could more easily talk to each other. She’s also felt support locally, in more informal, friendly ways. “Many people are saying, ‘Hi! Hi!’ Total strangers,” she said. Hussein sees anger toward Somali residents as a representation of grief — and it’s a grief she understands and shares. But she doesn’t believe everyone in Lewiston is angry at the city’s immigrants. Even in the Facebook group LA’s Journal, some members have called for peace, admonishing other members for racist comments and maintaining that Somali residents are not to blame for the city’s ills. A number of people and community group members declined to talk for this story, fearing that any public comments they made would fuel tensions. Some of that tension comes from the fact that police have not yet made an arrest. Online, people have questioned whether the police are covering for the Somali community. Maine State Police handle all homicides in Maine and are spearheading the investigation into Giusti’s death, with help from Lewiston police. Chief Brian O’Malley told the City Council on Tuesday that the investigation is ongoing and will take time as police track down everyone involved in the fight that night. Lewiston police have stepped up patrols in and around Kennedy Park and are enforcing a new 10 p.m. curfew in the park for everyone. And as tensions remain high, they are also watching any threats made on social media against the city’s immigrant residents. At the Immigration Resource Center of Maine, Hussein believes Lewiston can, and will, move forward. Editor’s note: We understand material contained in this story is alarming and difficult to read, but to accurately report the depth of hate we offered a small amount of the vast commentary that has risen since Donald Giusti’s death. 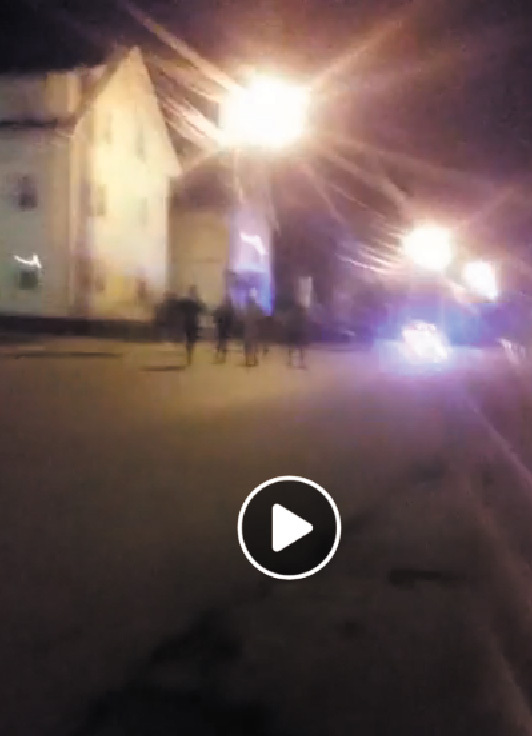 A still from a video that was taken shortly after a brawl near Kennedy Park in Lewiston on June 12 and circulated widely on Facebook. A 38-year-old Lewiston man was killed in the fracas.